Numismatic Guaranty Corporation® (NGC) has officially licensed the Astronaut Scholarship Foundation (ASF) logo for special NGC certification labels that celebrate the U.S. Mint’s Apollo 11 50th Anniversary Commemorative Coins. The coins go on sale January 24, 2019. The Apollo 11 50th Anniversary Commemorative Coins are among the most highly anticipated U.S. Mint issues of the last decade. The coins are particularly noteworthy for their curved design, which resembles the view of the moon’s surface from an astronaut’s helmet. Also significant is the curved silver five-ounce coin. The largest curved coin ever issued by the U.S. Mint with a diameter of three inches, its production presented numerous challenges. These were ultimately overcome and the Apollo 11 silver five-ounce is expected to become one of the most desirable US modern coins in recent memory. "NGC’s leadership in third-party coin certification made it an ideal partner to collaborate with ASF to promote its important mission and the Apollo 11 50th Anniversary Commemorative Coin Program," says Tammy Sudler, President & CEO of ASF. 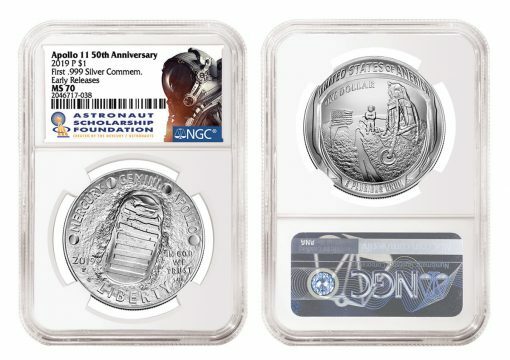 "NGC-certified Apollo 11 Commemorative Coins encapsulated with the NGC ASF label are unique and attractive collectibles that not only honor one of history’s greatest achievements but also support the mission of ASF." "The Apollo 11 50th Anniversary Commemorative Coins celebrate one of mankind’s greatest triumphs," adds Mark Salzberg, NGC Chairman and NGC Grading Finalizer. "NGC is pleased to work with the Astronaut Scholarship Foundation to honor this event and these coins with an attractive label that is sure to appeal to coin collectors and space enthusiasts alike." For detailed submission instructions, visit NGCcoin.com/ASF.